Eczema is a general term used to describe an inflammation of the skin. In fact, eczema is a series of chronic skin conditions that produces itchy rashes; scaly, dry and leathery areas; skin redness; or inflammation around blisters. It can be located anywhere on the body, but most frequently appears in the creases on the face, arms and legs. 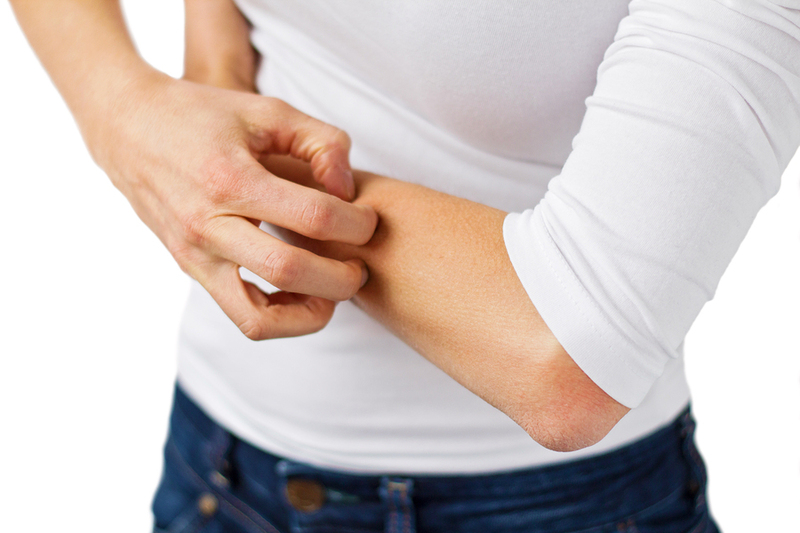 Itchiness is the key characteristic and symptom of eczema. When scratched, the lesions may begin to ooze and get crusted. Over time, painful cracks in the scaly, leathery tissue can form. Eczema affects people of all races, genders and ages. It is thought to be hereditary and is not contagious. The cause of eczema remains unknown, but it usually has physical, environmental or lifestyle triggers. Coming into contact with a trigger, such as wind or an allergy-producing fabric, launches the rash and inflammation. For mild cases, over-the-counter topical creams and antihistamines can relieve the itching. In persistent cases, a dermatologist will likely prescribe stronger medicines, such as steroid creams, oral steroids (corticosteroids), antibiotic pills or antifungal creams to treat any potential infection. Contact dermatitis is caused when the skin comes into contact with an allergy-producing agent or an irritant, such as a chemical. Finding the triggering allergen is important to treatment and prevention. Allergens can be things like laundry detergent, cosmetics, jewelry, fabrics, perfume, diapers and poison ivy or poison sumac. Also known as Lichen Simplex Chronicus, this is a chronic skin inflammation caused by a continuous cycle of scratching in response to a localized itch, like a mosquito bite. It creates scaly patches of skin, most commonly on the head, lower legs, wrists or forearms. Over time, the skin may become thickened and leathery.